By Tommas Graves – The banking community did not seem very contrite when blamed for the credit crunch. It was as if they had no idea why they were at fault, and now we observe that their main effort is to get back to exactly the same position as before, with the attendant remuneration basis. What are we to make of this? THE RISING TIDE THAT LIFTS ALL BOATS? 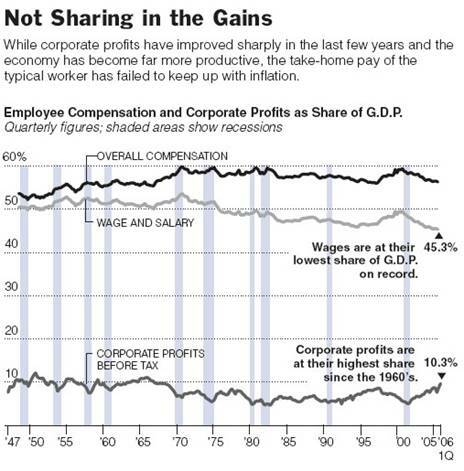 A further chart in the New York Times further makes the point that as a share of GDP wages are at their lowest since 1947, whilst corporate profits are at their highest since the 1960s. 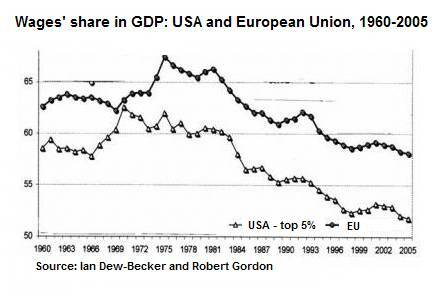 At http://en.internationalism.org/ir/133/china/graph3 it is shown that wages as a share of GDP in the EU has been declining since 1969. It seems to be a world wide phenomenon, and has been described as the knowledge revolution, that is extra productivity brought about by computers and communications. At http://www.measuringworth.org (click for graph) it is shown that UK Real GDP per Capita has tripled between 1960 and 2008 (shown in year 2003 pounds). RISING TIDE ONLY FOR SOME! A particularly vivid part of the answer is provided by Bryan Kavanagh in Prosper Australia. This may be viewed at http://www.prosper.org.au/2009/01/28/ineffective-demand/ . 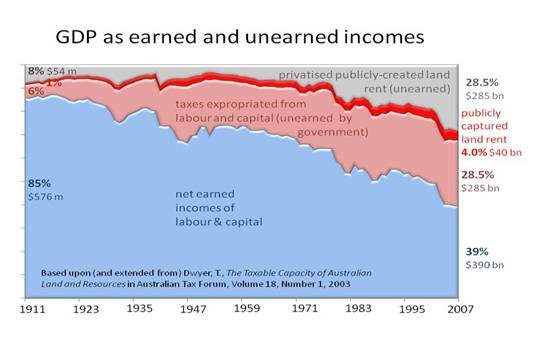 Here the decline in the share of GDP in Australia since 1911 is shown, but the rest of GDP is also shown as Taxes and Rent. The commentary shows how a badly designed tax system has finally choked off effective demand. Now, we might speculate that most of net wages is spent on just living. Taxation is spent on the services a community needs, and amelioration of poverty. But rent is surely not needed for living, and most will be spent on the acquisition of assets. As rents increased, the competition for assets also increased. Is this the cause of the “asset price hike”? In the State of Victoria, the number of years net salary required to buy the median house of all sales in the Melbourne Metro Area has increased from 4 in 1970 to 9 in 2007. (125% increase), whilst net wages in the same period have grown from $2500 to $30000, (1100% increase), land prices have grown from $2500 to $145000 (5700% increase). In these figures we get a glimpse of the pressure on asset prices (mostly land). Rent is paid for the access and use of buildings, the latter being a valid charge, but rent paid for access does nothing other than enrich the landowner, i.e. the person or company that owns the site made valuable by the expenditure of the community. Net wages include the vast sums paid in bonuses and salaries in banks and similar institutions, which are really a distribution of rent. Much rent, especially in city centres, is paid to corporations, which effectively translate it into salaries, dividends and profits. 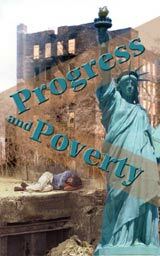 Those who have read “Progress and Poverty” by Henry George will know that he precisely forecast what has happened. Here is a quote from Chapter 22 taken from the simplified version which can be viewed at http://www.henrygeorge.org/pchp22.htm . “As population grows and technology advances, land values rise. This steady increase leads to speculation, as future increases are anticipated. Land values are carried beyond the point at which labor and capital would receive their customary returns. Production, therefore, begins to stop. It will be noticed in the Australian chart that the top portion is described as “privatised publicly-created land rent (unearned)”. If it is publicly created, whom does it belong to? Here we can see an alternative method of providing public goods and services. We simply give back to the community what it has created. The result would be that we no longer need to tax production. A brief consideration of this will show the enormous damage being done by our present tax system. In the first place, the employers’ value of the work done will be rather different from the employees. But also, this amount of taxation levied at the margins will put many sites out of use. This heaps more burden on taxpayers, for unemployment pay and benefits, so we get a downward spiral as extra tax forces yet more businesses out of production. And it is entirely voluntary! There is another way of doing it. A way that returns to the community what it creates, and leaves the individual with the product of his/her work. But what we have instead is, that part of the product is transferred from those who work to those who do not. No wonder we are in such a mess! So, what of the bankers, why were they so bemused? They did not know the cause of our troubles any more than the rest of us. But, of course, they had jumped on the bandwagon, and made huge profits thereby, most of which have now been lost due to unwise lending. There are three levels of transactions. Trading in the capital value of level 1 and speculation. The first level is what shapes our economy. The second level assists in providing certainty. The third level is largely the result of too much of the product of work landing up in too few pockets, -that is funds gained from feeding on the rental cream of central sites, which is fed into risk taking hedge funds that further hike the asset prices. No wonder the rich get richer! Of course it must be possible to buy and sell income streams, and as long as there is a satisfied buyer and seller, without coercion, no harm is done. But power is accumulated where most funds land up. Bankers are simply the servants of the real financial scandal, albeit legal, that is of appropriating the communal fund. The banking system has been obliged to reflect this condition, after all, their best clients need finance to acquire their assets. But the result is that credit for productive processes is restricted. Bankers are not necessarily the “baddies”. They are the agents of a perfectly legal “scam”. They get the blame, while as Churchill put it: “The landlord sits still”. So the remedy is to deal with the wrong distribution of the product of work. This will bring justice and fairness, give every one a chance to work, and the banking system will simply adjust to the new situation.